These stuffed dates look fancy, but are super easy to make. Don't want to brave the bar crowds or the cold? Didn't make dinner reservations in time? Don't stress, we've got you covered this New Year's Eve with four super easy (some ridiculously so) options for noshin' in the new year, whether you're having a small get-together with friends and family, or hosting a house full of football fans the next day. A couple of these dishes are so last-minute friendly, you probably have everything you need already. Cheers! Don't get me wrong, it's not like I go to formal dinner parties on the regular. But whenever I'm asked to bring a nice snack to a get-together, my absolute favorite thing to make is this recipe for tasty stuffed dates. Copied from a friend who copied from a restaurant that copied from... well, you get the idea, it's a popular dish with lots of iterations, and for good reason. 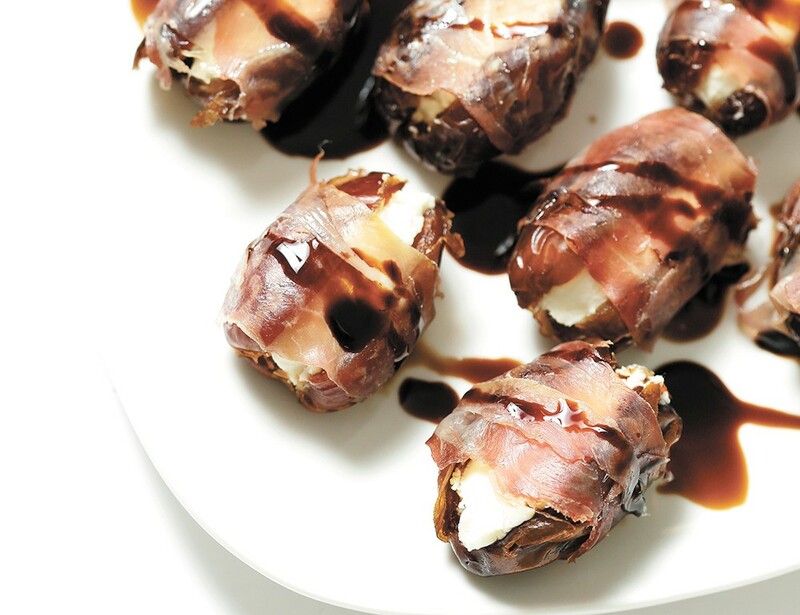 With each delectable bite, the combination of prosciutto, dates, goat cheese and balsamic reduction plays off every taste bud in sweet, sour, salty, savory harmony. It's darn near a perfect bite, making these a smash hit every time. 1. Heat the oven to 350 degrees. Pit the dates and use a spoon to fill each with goat cheese. 2. Wrap a strip of prosciutto around each stuffed date to seal in the cheese and then arrange them on a baking sheet about an inch apart. 3. Bake for about 10 minutes until the prosciutto is just starting to get crispy and the cheese and dates are warm. 4. Remove and drizzle with balsamic reduction, then return to the oven for another five minutes. Don't let mistletoe be the only form of greenery during your holidays. This easy curried pea salad only looks fancy and will make you the darling of your vegan friends, all from ingredients you may have on hand. When the garden is going, you might use spring peas, but frozen peas are actually ideal for this recipe. I think my family originally found this recipe on Pinterest, or maybe a cream cheese package, and the rest is lost to time. The result, however, is way better than it sounds — much to the prejudgement of fellow Inlander staffers when I told them about this last-minute family favorite. Seriously, though, any time we've made this for a large gathering, it's instantly devoured. Plus, it goes well with almost any dipping vehicle; just make sure you use sturdy crackers versus chips (I like Wheat Thins or Triscuits), since it takes some force to get a good scoop. When it comes to party foods, I demand only the least classy snacks imaginable. That's just how it has to be. Here's the super easy and low-rent — yet still delicious — dip that I've brought to end-of-the-year parties since time immemorial. So obviously I'm not a gourmet, but I'm telling you: This dip is always a crowd pleaser. I'm not totally sure what Velveeta is even made of — I think it's mostly oil, but I wouldn't dare look up the actual ingredients — but I do know that I couldn't imagine a Super Bowl shindig without it. The original print version of this article was headlined "Year-End Entertaining"